EcoTraining is about the small things, we all know this, and we truly believe it. The mechanisms evolved over millennia by the coexistence of organisms know no bounds: the relationship between figs and their wasp pollinators, the unique adaptations of an ant-lion larva to locate its prey and the fascinating behaviour exhibited by the polyandrous African Jacana are just some of the majesties awaiting a potential student on one of our courses. That being said, nothing beats witnessing interactions between Africa’s heavy hitters, the big cats! It’s a bit like buying a car: we know that we should spend our money on a nice safe and reliable family car with good fuel economy, but most of us would give our right arm to own an Aston Martin or Bugatti! There is just something about them. The cats are no different. They are the aces up the sleeve of the bush poker player, and the Mecca for any safari-goer! What happens in the bush under the cloak of darkness is a mystery to most, but occasionally the nocturnal exploits of these key players transcend the dawn and we are able to view some unique events unfold. Lions and leopards are mortal enemies. Countless generations have fought this war; a war where both sides have their special weapons. The lions have strength both in physicality and in numbers, but what the leopard lacks in this department it makes up with guile, agility and stealth. Both will kill each other, especially their offspring, and most young cubs succumb to predation by one of their carnivorous cousins. For a mother leopard nurturing a cub, a run-in with lions usually spells curtains, but lighting reactions and unparalleled tree climbing abilities might just be enough to save them. By the time we arrived at the sighting, we found a majestic leopardess patrolling the treetops whilst her nemeses circled below. Her footing was sure, and she almost mocked the comical attempts of the young lions far below her as they tried to scale the vertical trunk to reach her. She spat and growled, but knew better than to antagonize her much larger relatives. Her lightweight frame allowed her to control the canopy, but youth knows no bounds, and time and time again, the young lions tried their luck. This made for some great viewing as their facial expressions matched their frustrations as their powerful limbs were nullified by their greater body mass and weak wrists. Failed attempts ended in a shower of bark and a somewhat unceremonious dismount! As usual, it is difficult not to anthropomorphasize the events, but if a lion could ever look embarrassed, this was it! 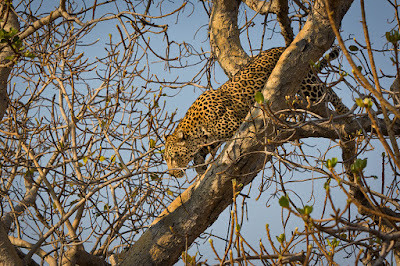 The leopardess however seemed distracted. Between bouts of snarling at her feline foes, she continued glancing skyward towards a nearby fig tree. Upon closer inspection we discovered a small cub, no more than 6 months old, sheltering in the upper reaches of its arboreal safe haven. Whilst we could hear no communication, their glances spoke a thousand words, the maternal bond felt by both easily bridging the gap between their refuges. Leopard cubs learn to climb from an early age, and this skill can save their life. 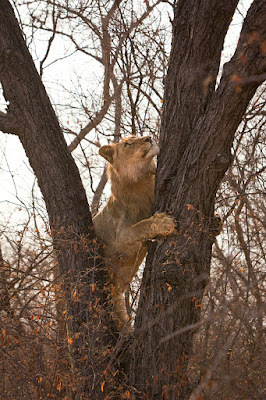 Despite balancing 10m from the ground, the cub looked sure-footed, relaxed and it matched its mother’s aggression towards its pursuers with low growls that defied its size. Not that the lions were too concerned. However, despite several attempts, the lions knew they were beaten. Disdainfully they relinquished their spot on the battlefield, slinking silently into the surrounding bush as the heat of the Sun sapped their resolve. The leopardess and her prodigy remained in their lofty sanctuary watching the retreat of their antagonists until the coast was clear. 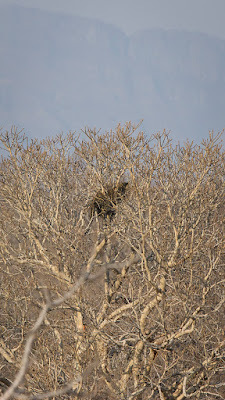 The female gracefully dismounted and moved to the shade of a nearby termite mound but her terrified cub remained aloft. 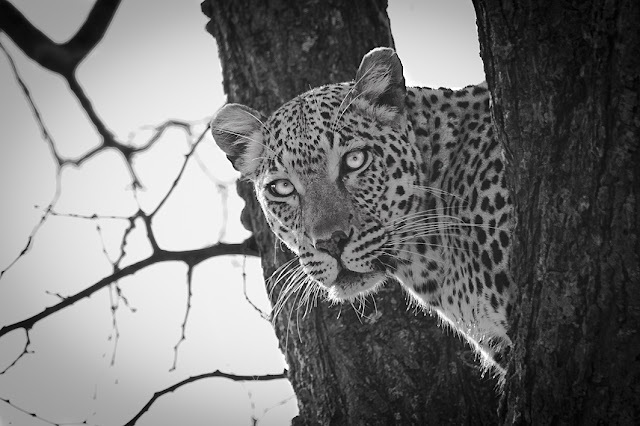 This female is not very relaxed around cars and whilst their ordeal was over, our ethics dictated that we leave the area to allow mother and cub to reunite and disappear back into the bush in the way that only leopards can. It was an epic sighting for us, but just another day in the endless struggle for survival of one of Africa’s greatest icons. The small things in the bush are fascinating, more so than many of you might realize, but some things are truly special. We all have our weaknesses, our addictions if you will, and mine is the leopard. 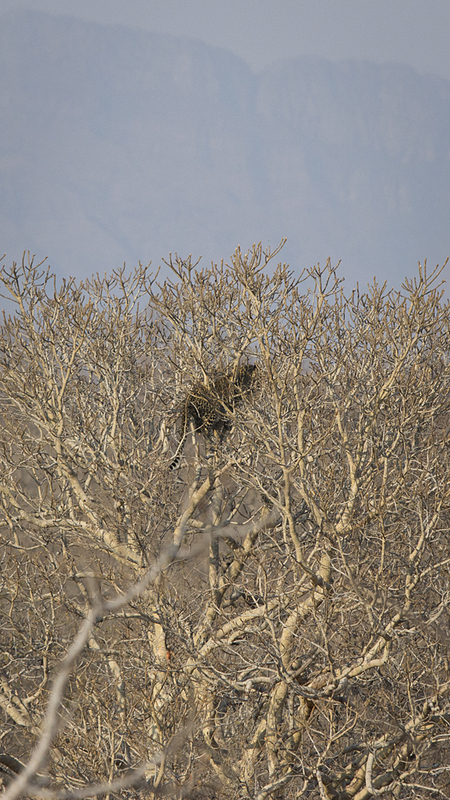 To see a mother and cub in a tree, and the interactions of hungry lions below them is as good as it gets!